Racehill is a community orchard in East Brighton. The orchard is situated on three acres overlooking Whitehawk and down to the sea. Get directions. It boasts native species of plants – including spear thistle, sycamore, wild parsnip, field scabious, wild basil and wild marjoram – as well as local wildlife. Community orchards are places where varieties of fruit are grown by and for local people. They provide healthy fruit to share, as well as a green haven for simple contemplation and enjoyment. They are also excellent wildlife habitats. The combination of fruit trees, grassland, scrub and other features offer a range of habitats. For example, a range of animals and insect life have been recorded within several hundred meters of the Racehill site. These include slow worms, adders and dunnocks. Community orchards can also help save vulnerable varieties of local apple, pear, cherry, plum and damson. In a similar way to community gardens, community orchards can revive interest in growing and providing a way of sharing knowledge and horticultural skills. 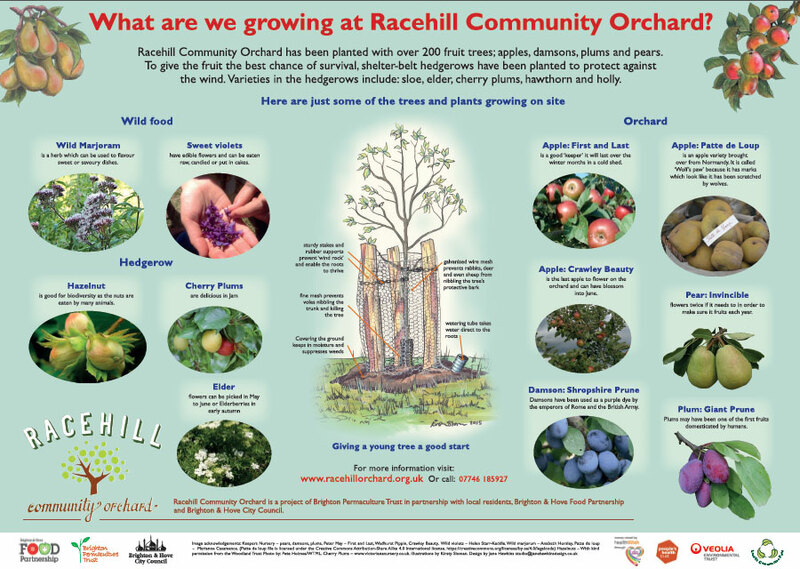 Racehill Community Orchard launched in January 2013 after a public consultation conducted by Brighton & Hove Food Partnership’s Harvest Project. A whopping 88% of respondents said they would like to see an orchard on the site. You can also review the Council consultation on the nature reserve.The land is leased from the council, with the Brighton & Hove City Council Park rangers also helping with work on the orchard. 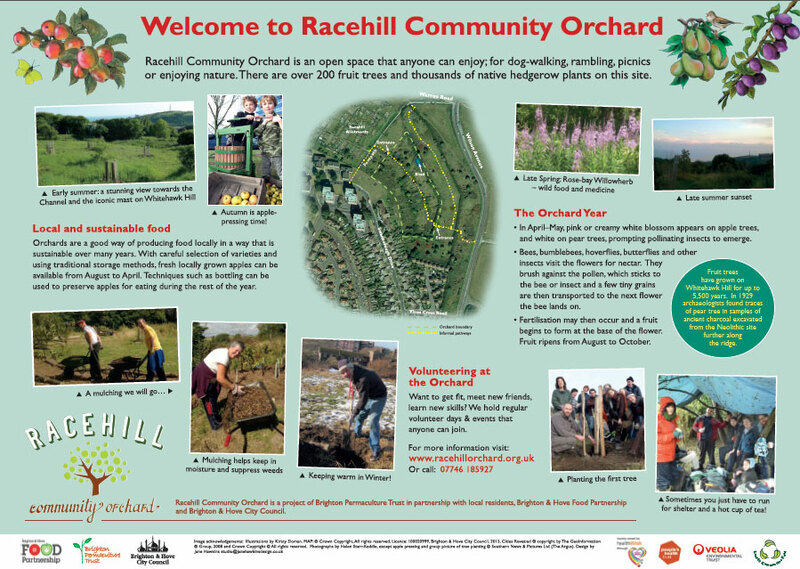 Racehill Orchard was originally managed by a community group of local people who volunteered regularly to plant trees, undertake conservation activities and enjoy being outside. Now, Brighton Permaculture Trust has taken over management of the site, after leading the planting activities. Brighton Permaculture Trust has a decade’s worth of experience helping people plant and maintain orchards. We continue to work in partnership with local residents, Brighton & Hove Food Partnership, and the Brighton & Hove City Council. 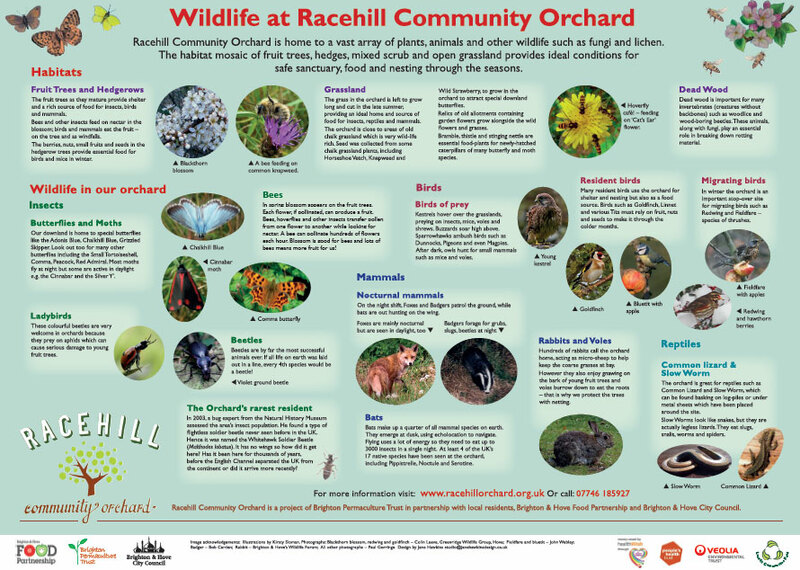 Under the guidance of Brighton Permaculture Trust, Racehill Orchard now boasts two hundred fruit trees and thousands of native hedgerow species. In future years, locals can enjoy the free fruit harvest. We hold regular activity days where anyone is welcome to come and get stuck in, or simply enjoy the space. We also welcome any school or volunteer groups to come and lend a hand.